This was VERY easy, quick and tasty and was a big hit with both Boy and Girl. This dish has definitely earned a spot in our permanent rotation. It’s not an “authentic” curry, but it super kid-friendly. I actually have a wonderful curry recipe from an Indian co-worker of Hubby’s. It has just the right amount of spice and is delicious, but more labor-intensive and much less kid-friendly than this version. I should have made that while the kids were at camp – DRAT. It’s not a terribly picturesque dish, but it was delicious. I started out with this recipe from Family Fun magazine, but adapted it a little. NB: About 2 cups of rice (uncooked) is the right amount to prepare to go with this. – I used fresh, seeded and chopped tomato (1 cup) instead of canned and added them after cooking the onions, but before adding the other ingredients, so that they could soften a little. – I added some chicken stock to the sauce (I had some left over from what I used to cook the accompanying rice). 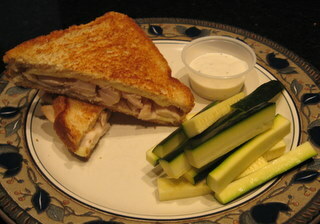 – I pureed the sauce before adding the chicken because I knew that Boy would not be a fan of visible chunks of tomato. – I browned the pieces of chicken separately a little bit before adding them to the sauce. 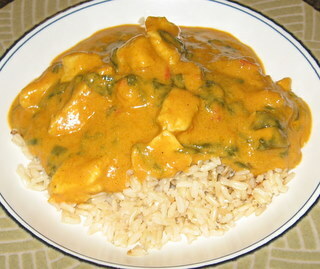 The next time that I make this, I will add a little bit more curry powder and will add more spinach. Sorry, we’re having issues getting Girl’s video posted to YouTube and getting the link to work. Hubby and I are trying to fix it right now and will get it back up as soon as we can. Boy was in the show, too, but had a duet with another boy. I need to speak to that boy’s parents to get permission before I post the video of their duet. As soon as I am able to get in touch with them, I will, hopefully, be able to post Boy’s video, too. Girl’s video appears to be working now. Keep an eye out for Boy’s video soon. If you are not “allowed” to see the video on YouTube, but would like to be added to the list, please email me and I’ll add you. As of right now, I have most family members added, plus Alan & Eileen, Jennifer M., Trish S. and Staci B.
UPDATE….again….Urgh….it’s still not working, after all…. Apparently, in order to do a “private” video, someone has to be my “friend” on YouTube. If you’d like to be a YouTube “friend” and see the videos (as well as some stellar videos of my cats using the toilet), please send me an email and I’ll add you. I don’t want to send out a million friends requests and make you all have to go through that sign-up rigamarole if you haven’t “opted in”. The amchoor (dried green mango powder) is completely optional, but it does give a sour, tangy flavor and will also help tenderize meats. Mix all ingredients and store in an airtight container. This seasoning is delicious as a rub for grilling meats or as a sprinkle on french fries or corn on the cob. 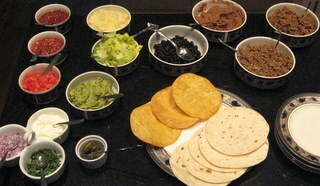 It’s also great when mixed into dips or added to sour cream that will be used to top quesadillas or tacos. This video has been labeled “private” on YouTube and is only available to people that I know are regular readers of the blog and/or friends and family. Most of you should already be on the list of people that are “allowed” to see the video automatically. If you are NOT on the list, but would like to be, please send me a quick email (address in the top R corner of this blog) and, if I know you, I’ll be happy to add your name to the list. Boy had a duet in the show and I will post his video as soon as I get permission from his duet partner’s parents to post the video. 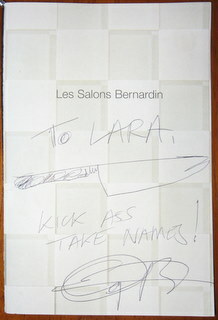 Anthony Bourdain’s autograph, that my parents got for me at a benefit in New York. This is SO getting framed to hang in my kitchen. 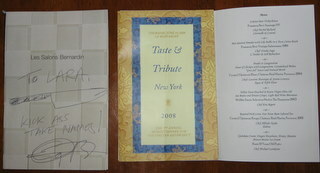 Autograph, with the full event program, including the delicious-sounding menu. Hubby and I would love to attend this event next year. My parents “won” a New York package that includes hotel, tix to see the Conan O’Brien show and a dinner at Le Bernardin with Jill Eikenberry and Michael Tucker (my mom says that his new book is really good) and also a separate Puerto Rico tour/food package. I’m only a little jealous. 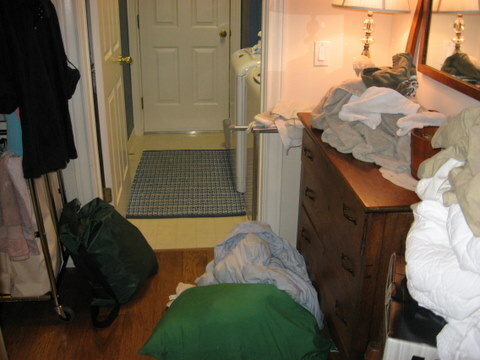 All week (since the kids were gone), I’ve been astounded at how little laundry there was to be done. Well, I’ve found it all! In case you’re wondering what I’ll be doing today…. Of course, Boy did me a favor by only actually wearing about 1/3 of the clothes that he packed for camp, so a lot of what he brought home was clean. He packed one outfit per day, so it doesn’t take a lot of imagination to be glad that we weren’t sharing space with him this week. Peee-yew. On balance, we liked the Top Secret Recipes version better; it was moister and had better flavor. All of us except Boy found the Cooks.com version WAY too salty. I also would probably prefer to use my own fresh onion and garlic, since I always have those on hand, instead of garlic powder and dried minced onion. 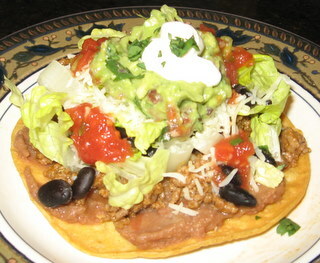 Here’s my suggestion, untested as of yet, but I’ll give it a try the next time that I make tacos. I think that it will take the best qualities of each recipe. Combine all of the dried spices in a small bowl (can be placed in a tightly sealed plastic container or zipper bag until needed). Brown ground beef with onions until no more pink is visible and meat is crumbly. Add garlic and cook about 1 more minute. Drain fat (I usually also pour very hot water over it in the colander, to remove residual grease). Return meat to pan. Add spices and water and cook, stirring occasionally, until water is almost all absorbed and a thick “sauce” has formed. If you prefer to use dried onion and garlic, you may use 1 tsp dried minced onion and 1/4 tsp garlic powder, instead of the fresh. Well…we’ve had some schedule changes this week. Our dinner plans for tonight were postponed because my grandfather wasn’t feeling well (I hope you are better soon, Pappaw – I love you!) and so I decided to go ahead and cook Sunday’s menu for us tonight, since I already had all of the ingredients on hand. I’m glad that I did, because the sausage was a little spicier than I thought it would be and I think it might have been a little bit much for Girl and Boy. Also, the matinee show that we were going to see on Sunday is sold out, so we’re going to see it Monday night, instead, which probably means that I won’t cook Monday night, so we’ll be shifting a bit this week, anyway. So, this recipe was my “inspiration”, but I adapted it A LOT. NOTE: Advance preparation (one day ahead) required. Pour 2/3 cup of the chicken stock into a small container and set aside. Lightly grease a bread pan (I think mine is 9 X 5?). Bring the rest of the stock to a simmer in a medium-sized saucepan. Add the salt and then pour in the polenta, in a slow, steady stream, stirring constantly. Lower the heat and cook until the polenta is thickened and is pulling away from the sides of the pan. Gently stir in 3 Tbsp of the Parmesan cheese and then pour the polenta into the bread pan. Refrigerate until solid (overnight?). Preheat oven to 400 degrees. Remove the polenta from the refrigerator and unmold it onto a cutting board. Cut the polenta crosswise into slices about 3/4 inch thick and then cut each slice in half from top to bottom, forming small “planks”. Saute the sausage coins in a large saute pan with a little olive oil, turning once to brown evenly on both sides. When all of the sausage slices are lightly browned, remove them from the pan (reserving the oil in the pan) and place them in a large ovenproof dish (something that would hold about the same amount as a 9 X 13 pan – shape doesn’t matter – whatever you’ve got that’s about that size is fine) and set aside. Saute the onions over medium-low heat in the same pan that you cooked the sausage in until they’re thoroughly softened and started to lightly brown/caramelize. Pour them in the baking dish over the sausage, still reserving the oil in the saute pan and adding more olive oil, if necessary. Saute the peppers in the pan until they’re lightly softened (cook them to your desired doneness – some people like them to still be a little crunchy, but some people like them completely soft and starting to brown) and then add the garlic and cook for about 1 minute, until the garlic is softened but not browning. Add the peppers and garlic to the baking dish. Sprinkle the sausage mixture with the thyme and then pour over the reserved chicken stock. Season with salt and pepper, if necessary (the sausage that I used had a LOT of both salt and pepper, so it didn’t need any additional seasoning). Place in the oven to re-warm/meld. While the sausage mixture bakes, heat some more olive oil (just enough to coat the bottom of the pan) to medium-high heat and saute the polenta planks, turning once, until they are warmed through and lightly browned on both sides. 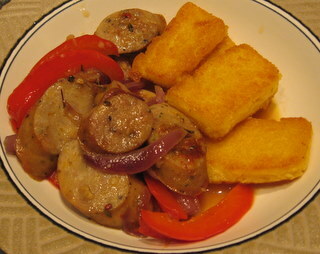 When the polenta is all cooked, remove the sausage from the oven and serve in wide, shallow bowls. Spoon a bit of the pan drippings over each serving and add a few polenta planks to the size. Sprinkle each portion with some of the reserved Parmesan cheese. This is definitely “make your guy happy” food.